Boasting over 18,000 islands, Indonesia represents the world's largest archipelago, serving as home to about 250 million people. A kaleidoscope of cultures, the country encompasses some 300 ethnic groups and nearly 750 different languages and dialects--an astounding cultural diversity that makes an Indonesia holiday especially rewarding. Begin your Indonesia tour by discovering the country's big cities, huge melting pots bursting with energy and soaked in centuries of dramatic history. From there, head farther afield: the nation's varied landscapes of volcanoes, white-sand beaches, and sprawling tropical forests draw adrenaline junkies seeking an exotic land offering perhaps the world's last truly great outdoor adventures. Bali: Known internationally as the place to go for beach holidays in Indonesia, Bali offers plenty more besides that classic sun and sand experience, with the island's rich cultural diversity, welcoming locals, archaeological sites, and cuisine adding to the appeal of the picturesque and lively coastline. Java: The political and economic center of the country, Java includes many of the major urban centers in Indonesia, each with its own set of galleries and museums, stylish restaurants, and historical attractions, as well as some of the wildest and richest landscapes in the country. West Nusa Tenggara: The islands of West Nusa Tenggara offer adventure and relaxation, with tourist-focused towns providing access to popular offshore dive sites, seafood restaurants, and excursions, as well as more remote, traditional villages rich in culture and history, surrounded by thick, wild jungle. Sumatra: The wild, untamed landscape of Sumatra provides the setting for many adventurous Indonesia itineraries, with smoking volcanic craters towering over unspoiled areas of jungle, home to orangutans, rhinos, elephants, and tigers. Sulawesi: Sulawesi offers access to many beaches and offshore reefs, while its mountainous interior features jungles unspoiled by human interference. East Nusa Tenggara: An archipelago known for its volcanic craters and arid climate, East Nusa Tengarra provides a fitting habitat for the Komodo dragon. Kalimantan: Kalimantan, the Indonesian part of Borneo, is home to a startlingly large range of wildlife, with visitors drawn particularly towards the swathes of humid rainforest inhabited by orangutans. Riau Islands Province: The many islands of Riau Islands Province hide sheltered bays ideal for snorkeling and diving, as well as centuries-old fishing villages where a traditional, agricultural way of life is preserved. Maluku Islands: Once a center of the spice trade, Maluku Islands fell from international focus in the 18th century, allowing the diverse landscape and richness of wildlife to recover and a feeling of remoteness and adventure to take hold. Ubud: An artsy town at the center of a picturesque rural area, Ubud keeps visitors entertained with a set of performance spaces, galleries, and museums. Kuta: One of the most popular attractions in Indonesia, Kuta is known for its long, lively beaches rich in entertainment options and activities, as well as a bustling nightlife scene of stylish restaurants and raucous bars. Denpasar: Denpasar boasts a range of modern restaurants and lively bars, souvenir shops and large malls, as well as long sandy beaches and historical sites. Jakarta:The country's capital, Jakarta weds modernity and tradition in a chaotic but enriching tableau, with bustling old markets sitting next to skyscrapers and historic colonial districts filled with museums, stylish eateries, and public parks. Seminyak: Seminyak has become popular with international tourists because of its diving opportunities, hotel-lined beach, and craft markets, as well as its proximity to some of the island's wildest jungles. Sacred Monkey Forest Sanctuary: A place of spirituality and ecology, this sanctuary sits in the jungle and includes a temple complex from the 14th century, now providing a home for a community of macaques. 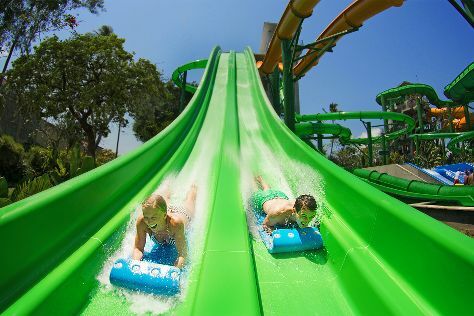 Waterbom Bali: A water park with attractively landscaped grounds, Waterbom Bali features pools, slides, and spas, as well as restaurants serving local and international specialties. Tanah Lot Temple: Sitting on a large offshore rock, this 16th-century temple remains a popular place for Hindu pilgrimages, while its dramatic location makes it one of the island's key landmarks. Uluwatu Temple: Dramatically perched on the edge of rocky cliffs,	this temple stands as one of the island's most revered religious sites, providing a home for local monkeys. Prambanan Temples: A World Heritage Site, Prambanan Temples were as constructed in the 9th century and feature 8 main shrines, each with carved exterior decorations and spires, fine examples of Hindu sculpture and architecture. Borobudur Temple: Borobudur Temple was constructed during the 9th century using over 2 million stone bricks--today, it's one of the largest Buddhist shrines in the world, protected by UNESCO for its cultural and historical importance. Kuta Beach - Bali: Bustling Kuta Beach serves as a premier spot for surfing, swimming and hanging out by the sea--the sandy coastline is lined with surf rental stores, restaurants, and bars. Bali Safari & Marine Park: This popular attraction in Indonesia includes a water park, performance areas (where visitors try their hand at traditional Balinese dances), and a natural habitat for over 60 different species, including elephants, snakes, and birds. Tegalalang Rice Terrace: Tegalalang Rice Terrace consists of a set of distinctively tiered paddies, providing nutrition and a livelihood for locals while also attracting artists and photographers. Sanur Beach: The sands of Sanur Beach provide the location for many relaxing Indonesia vacations, with access to popular hotels and eateries, and tour and diving boats cruising around offshore. Beach resort towns of all shapes and sizes remain the main draw for families on vacation in Indonesia, each offering plenty of accommodations, outdoor activity centers, and amenities. The country's developed tourist infrastructure allows for comfort and ease with, for instance, restaurants serving international cuisine and plenty of English speakers in the main resort towns. A trip with kids to Java can be particularly enriching, with the island a center of culture and history. Many families staying on Java choose to spend time in Yogyakarta, an ancient city with historical attractions and good tourist infrastructure. Intense, frantic, but ultimately rewarding, Jakarta has plenty to offer, including museums, eateries, and entertainments. Each island offers the chance to meet Indonesian wildlife up close; those looking to enjoy a bird-watching, trekking, or animal-spotting vacation in Indonesia should head to the national parks of Kalimantan. A safe bet for those staying on Bali is Waterbom Bali, an activity-packed water park with well-maintained landscaped grounds. Bridging the gap between theme park and nature reserve, Bali Safari & Marine Park offers a manageable environment where kids can explore the natural heritage of the country and meet some of its most famous residents. On Java, Batu Secret Zoo offers a similar chance for little ones to discover the natural riches of this part of the world. Head over the a protected area of wilderness like Tanjung Puting National Park, and kids ready for a little more adventure can see a stunning amount of wildlife in its natural habitat, including orangutans, proboscis monkeys, and daydream-inducing birds of paradise. If you or the kids wish to learn more about the culture or history of the islands, visit some of the country's main archaeological sites or temples, such as UNESCO-listed Borobudur Temple. If this is your first trip to Indonesia, kids are unlikely to have seen anything quite like it before. The Indonesian people are well-known for their love of kids and families, both in the internationalized tourist towns and more local, traditional rural areas, so expect a warm welcome during your Indonesia holiday. Be careful in large cities, where the streets can be crowded--keep the little ones in sight or hold their hands to avoid getting separated or lost in unfamiliar areas. The larger and more touristy urban areas offer a range of places to shop for the things your kids need, but if you're traveling farther afield, try to bring the essentials with you. While travel on the main islands is a comfortable and simple affair, heading out to some of the lesser islands can be time-consuming and more challenging due to underdeveloped infrastructure. Drink only bottled water, use your discretion when it comes to street food, and bring plenty of mosquito repellent and sunscreen. Classics like "nasi goreng" (fried rice with an endless variety of toppings) and "gado-gado" (a salad of blanched vegetables topped with peanut sauce and crackers) are found in most places, from the bustling side streets of Jakarta, to quieter family-run restaurants on the remote islands. The range of dishes, flavors, and cooking traditions from different ethnic groups remains the top reason for taking a food-inspired trip to Indonesia. Ethnic influences constantly blend in new and interesting ways, creating original dishes or giving old favorites a different twist. "Rendang (a dry meaty curry made with coconut milk), for example, originated with the Minangkabau people of Sumatra, but today can be found across the archipelago, served in myriad different ways. The same goes for "sate ayam" (satay chicken), a staple of Javanese cuisine now found cooking on open BBQs throughout the country. Vegetarians will have plenty to choose from when looking for a good square meal, with tofu, jackfruit, and tempeh frequently used in curries, noodles, and rice dishes, and plenty of side-dish fried delights as well. "Sambal," a chili sauce that sits on the table for most meals, allows you to adjust the heat of your food and is great for dipping "krupuk" and "emping," traditional Indonesian crackers. Whether you're looking for some essentials you forgot to bring with you, or something special to take home, your holiday in Indonesia will not lack in shopping opportunities. Visit Jakarta for some of the biggest malls in the region, with shiny, modern blocks featuring a wealth of international and local brands. Elsewhere on Java, Yogyakarta offers a number of places to pick up traditional Javanese art and silver jewelry, sold by both local craft markets and stylish modern galleries. It's also possible to find authentic Indonesian products on Bali, with religious icons, patterned batiks, and other handicrafts sold by most markets in the main tourist towns and farther afield. Bali is well-known for its souvenir shops, with entire promenades seemingly devoted to little trinkets, mementos, funny T-shirts, and the like. Check the quality of the products in such places before purchasing to make sure you're getting what you pay for. Though many destinations in the country are used to foreigners unfamiliar with the local etiquette, traditions, and social norms, there are a few things to bear in mind when starting your holiday in Indonesia. Anger is a rare emotion among the locals and is considered rude, with religious beliefs and cultural traditions denoting that problems are best resolved collaboratively and calmly. Try to remember to point at things using the thumb of your right hand, rather than your index finger, and don't lead with your left hand when greeting someone, or giving or receiving something (the left hand is associated with personal hygiene). Remember to take off your shoes when you enter someone's home, and never show anyone the bottom of your feet. Elders and authority figures are treated with great respect throughout the country, so greet older people with a small bow to show respect and deference. Indonesia celebrates its Independence Day on August 17, with special parades in Jakarta and other major cities. These events usually include musical and dance performances and lots of tasty food to try. On February 15 Indonesians celebrate the birth of the Prophet Muhammad, with great feasts, cultural performances, and stalls set up in spiritual centers such as Yogyakarta. The Balinese festival of Galungan celebrates the victory of good over evil and marks a time when the spirits of ancestors return to their homes--huge feasts are held in their honor. The exact date of Galungan is calculated using the 210-day Balinese calendar. The multi-ethnic country has a particularly welcoming and inclusive atmosphere during times of celebration, so look ahead at what will be happening during your trip to Indonesia to join in with the festivities and learn more about the local culture. When it comes to greeting etiquette, it's a good idea to follow the lead of the person you're meeting when on vacation in Indonesia. Customs differ from island to island, from culture to culture, and often depend on a person's religious or social values. Men usually greet one another with a handshake, while women sometimes prefer a kiss on the cheek. Contact is usually limited between genders, so a small bow and a salutation will usually suffice when greeting someone of the opposite gender. To show respect to your hosts, try using "selamat pagi" (good morning), "selamat siang" (good day), "selamat sore" (good afternoon), and "selamat malam" (good evening). In less formal circumstances, you can drop the "selamat" and just use the appropriate time of day. Indonesia enjoys a tropical climate with temperatures remaining fairly consistent throughout the year, with the highest mountain areas averaging 23 C (73 F), and the coast 28 C (82 F). The main weather element you'll likely encounter during your Indonesia holiday is rainfall, brought on by monsoons. Broadly speaking, the rainy season lasts from December to March, and the dry season from June to September. The monsoon clouds move in a northwesterly direction, making the northwesterly islands the wettest in Indonesia. There's a risk of typhoons between September and December. Although their power can be minimal, it's good to check the extended weather forecast for your destination before packing for your trip to Indonesia. For arriving international visitors just beginning their vacation in Indonesia, airports in Jakarta and Denpasar are the most commonly used. The capital has a busy suburban railway network, though rail services on other islands are primarily used for freight. For travel around most islands, visitors rely on the road network. Buses remain a particularly popular way of getting from one urban area to another, while cross-town travel is best in a taxi or a cycle rickshaw. Indonesia has a developed and extensive domestic air travel network for hopping between islands, as well as good ferry connections between major urban centers. There is no strict tipping etiquette to conform to during your vacation in Indonesia, but with wages in the service industry particularly low--and service usually of a particularly welcoming and helpful nature--many visitors like to leave a small tip. Consider leaving 10 percent of the total bill in restaurants when no automatic service charge has been added. Taxi drivers usually expect fares to be rounded up, and rarely carry the correct change.